This item is Out of Stock. Please see our line of other great Home Gumball Banks here! Our largest Gumball Bank stands at 15" (38.1cm) tall. It combines a 7.5"(19.05 cm) cast metal base with a 7.5"(19.05 cm) clear glass globe to impress all who see it. The silver cast metal base is durable and solid. 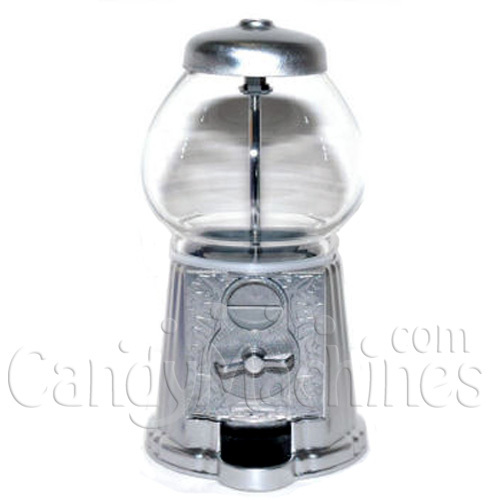 The dispensing mechanism is adjustable to vary the amount of candy or gumballs dispensed and an anti-spill cover keeps those candies or gumballs in the tray. Elegant silver finish. For table top use, or can be mounted on 4 legged metal stand. Holds 62 oz of candy or 1/2" Gumballs. Two tubs of 1/2" Junior Gumballs (Item 2117-T) fill this bank approximately one time. from Palm Springs Silver is nice. The silver finish made a great addition to my mothers kitchen, glad you had it to offer.